I will be completing 25th marriage anniversary this year. Just wanted to share some of the photographs and my views. 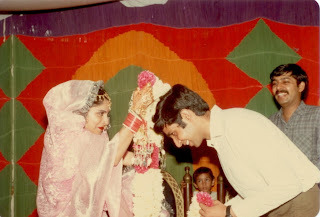 I got married at the age of 24 years and was working with DCM Data Products . Geeta was 23 years old and was working as Maths teacher at Manav Stahli School. I had ideas of low cost, no dowry marriage,. However Geeta's family wanted a normal conventional marriage. 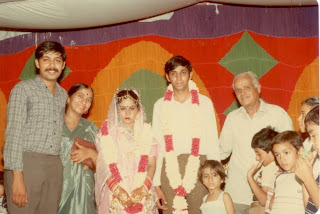 Result was what you can see in the enclosed photographs, I was in normal clothes, no coat or tie, borrowed shoes from Vijay, there was no loud music from a band, no decorative lights at our home, day marriage on a sunday afternoon, no religious ceremonies at our home. While Geeta was dressed like a bride and their family followed all religious ceremonies in their family. After marriage we were literally a text book example from MAN ARE FROM MARS AND WOMEN ARE FROM VENUS. However over last 25 years, we have learned the art of understanding the difference between people from mars and venus. We go thru pre-school, school and college and do lot of professional courses and learn every thing like English, Maths, Electronics, Engineering, Medicines, why not have formal class room training on personal relations and how to handle marriage? I just read your blog and it was so good to see you so young.Its amazing that you are dressed up so casually at the big day of your life..!! The pic states your simplicity in one shot..! Right Dad ... I m soo much with you regarding educating people on how to deal with relationships...This can be another area I can work on ...Thanks for promoting the need of guidance and counselling...!! !